The powerful typhoon that hit Japan on Wednesday has been making its way across the country, bringing floods, damage and deaths. At least 10 people have been killed by Typhoon Roke, with many others missing or injured, local media reported. The storm, which caused winds of 162km/h (100mph), passed near the capital Tokyo and the damaged nuclear power plant at Fukushima. However, it now looks as if the storm is losing strength. Roke, the second typhoon to hit Japan this month, made landfall on Wednesday afternoon (0500GMT) in Hamamatsu. It then moved up the main island of Honshu before passing near Tokyo, where thousands of commuters were stranded with trains suspended. More than 200 domestic flights were also cancelled, while at least 200,000 households in central Japan were without electricity late on Wednesday, according to the AP news agency. The typhoon later headed up Japan's north-east coast past Fukushima. Those killed included an elderly woman buried in a landslide in Iwate prefecture and a sewerage worker in the city of Sendai. One of the main worries was that the heavy rain could force radioactive water from the crippled Fukushima Daiichi nuclear plant into the sea. The plant is run by Tokyo Electric Power Co (Tepco), which said the storm had damaged security cameras but that it did not appear to have caused any water to overflow. 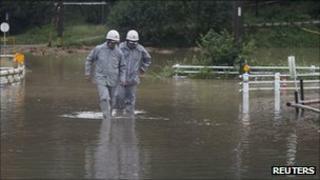 "We are seeing no problems so far," said Tepco spokesman Hiroki Kawamata. Engineers have been using water to cool reactors since the 11 March earthquake and tsunami knocked out cooling systems - but this has led to an accumulation of contaminated waste water at the plant. Have you been affected by Typhoon Roke? Are you making preparations or evacuating? If you are in this area you can let us know what is happening by filling in the form below.